When Venom sinks its razor-sharp teeth into cinemas on October 5, it'll toss in a double dose of goodness after its credits have rolled. 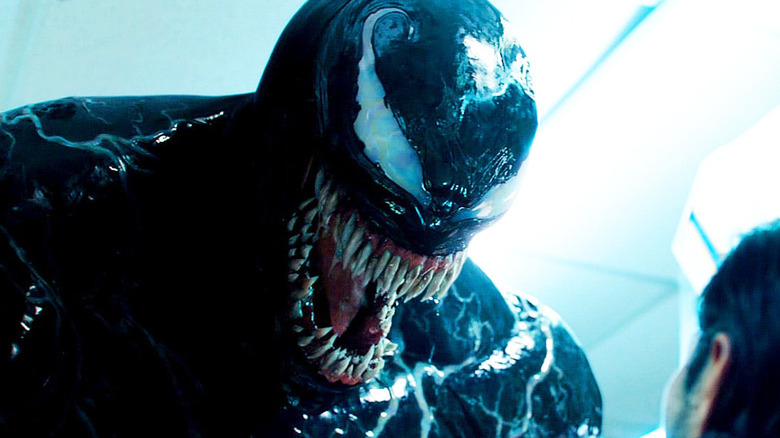 Though the Tom Hardy-starring, Ruben Fleischer-directed not-your-average-comic-book-movie isn't due out for a few more days, several entertainment and pop culture news outlets have already obtained a juicy piece of insider information: Venom will offer two post-credits scenes. Jeremy Conrad of MCU Cosmic was seemingly the first to dish up the details on the extra clips. For those of you who want to walk into Venom knowing only the basics about what will go down, we advise you avert your eyes, close your internet browser, and go sink some hours into perfecting your Fortnite gameplay strategy. Abandon hope of having an untainted Venom-viewing experience all ye who enter here, as serious spoilers are ahead. According to MCU Cosmic, the first Venom post-credits scene will see Hardy's Eddie Brock miraculously maintaining his job as a journalist even after transforming into the people-eating, fang-toothed Venom. Eddie, hungry to chase down new leads and cover a fresh story, is said to travel to San Quentin prison to interview a very special someone: Cletus Kasady, the serial killer better known in the Marvel Comics as Carnage. The outlet notes that Kasady "is indeed played by Woody Harrelson," the True Detective actor long rumored to step into the villainous role. Harrelson will reportedly get his Pennywise on by donning a ginger wig, looking similar to what the demented clown might look like without his makeup, and will ask Eddie if he "wants to hear the carnage" of the murders he's committed. That's a grade-A, by-the-books tease for a sequel if we've ever seen one, gang, so regardless of how you end up feeling about Venom upon seeing it, another film is coming in hot. Spreading out every piece of Venom info we've gotten our hands on in the past, we can see that the possibility of a sequel-establishing post-credits scene like this one has been staring us in the face for months. After plenty of speculation and tons of uncertainty, Harrelson finally broke his silence earlier this year by confirming his involvement in Venom — and in an untitled Venom sequel. "I'm in a little fraction of this movie, but I'll be in the next one, you know?" the actor told Collider in May 2018. "So I haven't read that script, but anyways, just rolled the dice." Prior to Harrelson's remarks, That Hashtag Show published an article noting that Kasady wouldn't appear in the "main body" of Venom, but that the character would pop up in a post-credit sequence that takes place in San Quentin prison. The outlet cited an unnamed source that detailed Ravencroft Institute founder Dr. Ashley Kafka, who is highly experienced in treating criminally insane superheroes, would have Kasady in her care and would ultimately introduce him to Eddie. THS' source also relayed that during Eddie's talk with Kasady, a part of the Venom symbiote starts lurching toward him before the screen cuts to black. This suggests that somewhere between the first and second Venom movies, Kasady will obtain a symbiote of his own, thus metamorphosing into Carnage. If true, this would align with the Marvel Comics lore, in which Kasady transforms into the beastly entity after a prison outbreak. As for the second post-credits scene in Venom, it reportedly opens with a scrawl of text — "Meanwhile, in another Spider-Verse…" — before offering a sneak peek at Sony's upcoming animated feature Spider-Man: Into the Spider-Verse. This scene is arguably less exciting than the first one, since it isn't directly related to Venom, but it should nonetheless put a smile on the faces of fans who love all things Spidey-related. So, now that we know what the Venom post-credits scenes will entail, when can viewers expect to see them? MCU Cosmic detailed that the first scene is the "traditional mid-credits one like most movies have," and the second serves as "a little something after all of the credits finish rolling." Contrarily, Screen Rant relayed that the additional bits of footage will actually play out back-to-back — thus shaking up the traditional structure of post-credits scenes in which part of the movie's credits swipe across the screen, the first scene unreels, the remainder of the credits roll, and the second scene plays. It's difficult to confirm which outlet is correct here, as we haven't gotten our peepers on Venom just yet, but if Screen Rant's report is to be believed, it'll prove that Fleischer didn't want to do with Venom's post-credits scenes what other directors have done with their films'. If MCU Cosmic ends up being right, however, Venom will stick to the status quo and its extra scenes will do what all good after-credits clips should: hint at what's to come in the franchise, dropping both big bombshells and audiences' jaws in the process. As director Fleischer sagely said earlier this month, "It would be a mistake of any superhero movie not to stay through the credits." So keep those buns in those popcorn-covered movie theater seats, dudes. You won't want to miss the madness that unfolds around Venom's credits.